The Longer You Wait…The Longer It Takes! Later on I was reflecting about all I have to get done. I have to deep clean my house, finish shopping for the Christmas dinner I’m hosting, and go shopping for gifts. This is in addition to life outside of the Christmas season; I need to grade and record several assignments, sit down and pay some bills, and the list goes on, and on, AND ON!! Just then my words came back to me, “…the longer you wait, the longer it takes…” Yes my students have an issue with procrastination but so do I! Procrastination is “the act of willfully delaying the doing of something that should be done,” and in some people it is a habitual way of handling any task. There was so much I could have been getting done all along. 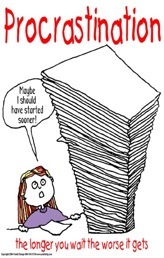 Instead of letting my students’ papers pile up, I could have graded an assignment or two everyday. Christmas comes at the same time EVERY year so I could have been purchasing things throughout the year and had them ready. Oh and my house–I wouldn’t have to do such a deep clean if I had been more diligent in weekly spot cleaning. Thank You for giving us the ability and the strength to do all the things that we need to do. Help us to be more diligent at getting tasks completed. Give us wisdom to prioritize and manage our time efficiently and effectively so that we can complete every task You have laid before us. In Jesus’ Name, Amen! Ladies, I EMPOWER you to STOP PROCRASTINATING!! There is so much we have to do in order to build the kingdom of God and reach the individual destinies we have for our lives. We have no time to waste! Katrina,as I sit here and read this entry and think about the “things” I should had done and could had done,I visit the grace of God because I not only have things for me on my “to-do list”,but he does as well and I fail the both of us sometimes. I’m glad that you placed blame where it needs to go on ourselves. I’m so ignorant of time. There have been many times the Holy Spirit have whispered to me to do something(clean the house,pray,witness,etc.) and I ignored him and rebelled to do what was pleasing to my flesh. It’s ok to occasionally have a moment to be lazy,but to make it a lifestyle is foolishness and I have done just this. I’m confessing this so that I may be humbled.He who hung upon the cross foresaw us as unbelieving, backsliding, cold of heart, indifferent, careless, lax in prayer, and yet He said, “I am the Lord thy God, the Holy One of Israel, thy Saviour.Since thou was precious in My sight and I have loved thee: therefore will I give men for thee, and people for thy life”! See how he shines! He just Loves us so much and thank you Jesus for the redemption! Your Love reached from the cross to our hearts today and I say,thank you Jesus! I started this comment just thinking about it,but it has ended up as a heart action repentance. With grace and mercy,I’m repenting,and I have you to thank Katrina. Thank you all EM for being messengers of God,now continue because JESUS needs your for his service! Praise the Lord! Thank you Lisa for your comment and for sharing your thoughts and worship to God with us. Beverly, I’m right there with you, thank you for sharing. Wow! You sure you don’t teach in my school? Same struggles….with them and myself! Thanks for sharing! i can really relate to this post! My To Do List has become my best friend over the past few months. I try to prioritize the top 3 each day and make sure I at least get those done. Thank you for sharing!